In the Spring of 1985 I was semi-homeless. I had given up my tiny studio apartment in the North End of Boston and was traveling around like a hobo staying with every friend and/or relative who had an available couch to sleep on. It was after I had finished my classes in grad school, but before I was able to secure respectable employment or establish an address to call my own. My way of dealing with this tenuous status was to take in as much high culture as possible - but on a shoe-string budget. While visiting my Aunt Helen in NY, I attended concerts every night. But the one I recall the most was a production at the Metropolitan Opera of Wagner's Parsifal. The Metropolitan Opera House was then, as it is now, a major venue with about 3,800 seats. The premium seats in the orchestra cost a small fortune, but there are also 195 "standing room" tickets that can be purchased on the day of the performance for small change. It's a popular option for students and opera enthusiasts who don't mind standing for long durations. Parsifal is over five hours long. As it turned out, on the week night I was there many of the patrons sitting in the orchestra section didn't have the stamina to hang in there for the duration. After the first act many prime seats became vacated. From the back of the hall I could see that two front-row center seats were empty, and I made my move. I like seat #108. It's kinda like being in virtual reality. 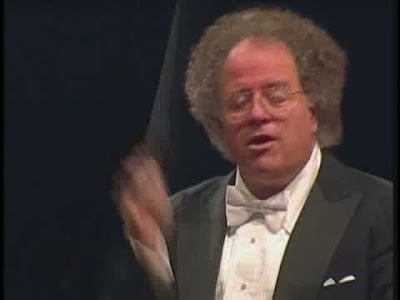 It's also as close as the general public can get to sitting "in" the orchestra, or being up on the stage with the singer s. I was literally inches away from Maestro James Levine, and could read the notes of his musical score. I was tempted to reach out and rub his bushy head, but restrained myself from doing so. The sound was superb too. To be able to observe the expressions on the faces of the singers adds a dimension to the live opera experience that few people are ever able experience. When sitting in that comfortable seat, the 3,800 people sitting behind me simply vanished. They were out of sight and out of mind. That night, Wagner's final opera was presented to me as a private performance - and I loved every second of it. Oddly, it warped my perception of time. It was perhaps the shortest five hours of my life.